Preventing and Curing Your Pool of Algae | Pinnacle USA, Inc.
One clear factor that something is not right with the health of your pool is color. Algae is an easy problem to see that doesn’t leave the best impression. Luckily, treatment is can be dealt with effectively. Here are some tips on how to treat your algae problems based on what color algae you have. 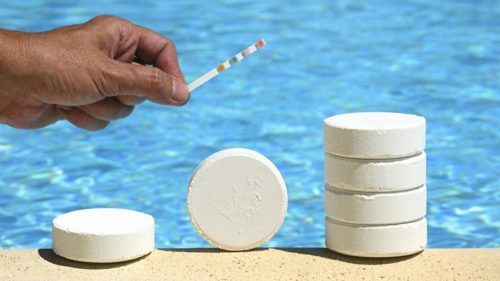 Remember to always follow the manufacturers’ directions when using and storing any pool chemicals. The most common of the culprits you will find is green algae. This alga appears most when you have low levels of pool sanitizer or poor water circulation. 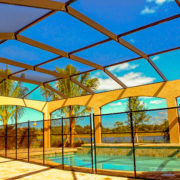 Some of the effects can include murky or cloudy waters but if left untreated can worsen to full obscurity and even staining the floors, walls, and steps of the pool. Not to fear, this is the easiest type of algae to cure. A simple increase of chlorine or an addition of algaecide can quickly remove any unwater algae. By maintaining proper chemical levels in the pool, you can help prevent green algae from ever forming. This alga may be considered to be the peskiest and hardest to distinguish. 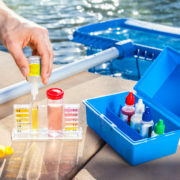 In your standard blue water pool, your yellow algae may tend to look green, however, and easy way to help set them apart is the lack of murky or cloudy water. One problem pool owners often find themselves in is thinking their pool may just be covered with pollen or dirt when in actuality you may have a build up of yellow algae. The best way to check would be to scrub the walls and see if the stains return. Dirt or pollen will fall to the floors of a pool, while algae will stick back to the walls. The reason why it is so pesky, however, is because it can cultivate even in a well chemically balanced pool. If you find yourself the victim of yellow algae don’t worry, just add in a stronger chlorinator or algaecide that focuses specifically on yellow algae. 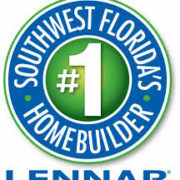 Black algae can appear in a few areas; where the plaster is etched or pitted and where calcium deposits have formed. It’s most easily identifiable as black dots that appear in these locations and can be removed through daily scrubbing from a steel brush. Make sure to tackle it as soon as possible because in severe cases contaminated black algae spots are untreatable and you can only help control it. All in all, you can help keep algae away by maintaining both basic chemical and physical pool maintenance. Chemical maintenance means your chlorine and pH levels are with the target ranges. The Model Aquatic Health Code provided by the US Centers for Disease Control and Prevention, states chlorine levels should range between 1-4 ppm pH should be 7.2-7.8 with the target goal being 7.4-7.6. 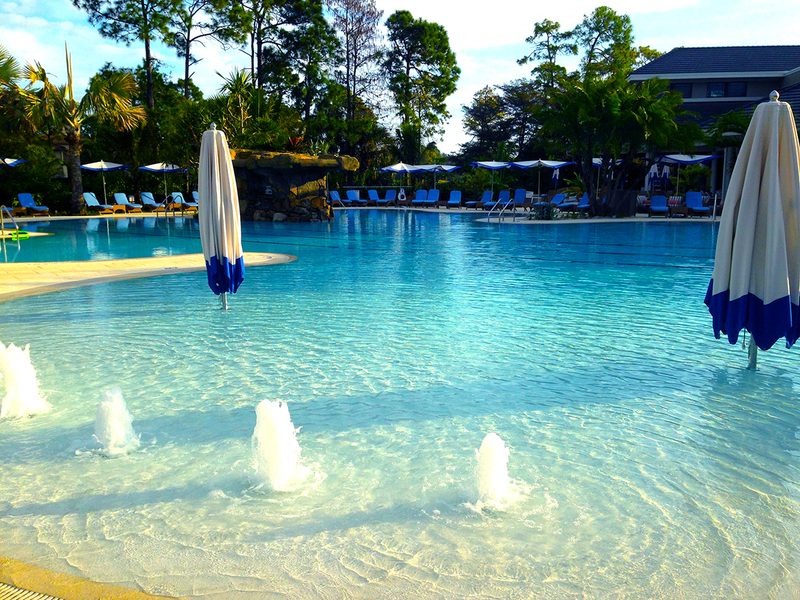 As you might have guessed, physical maintenance entails mostly of scrubbing and vacuuming the pool. 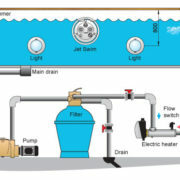 Remember to clean the pump and skimmer baskets and to clean your pool filters. A stagnant pool can also lead to algae build up so try to operate your pumps and filters for 8-10 hours a day to keep a constant flow of water. This article is based on “Tips and tricks for identifying and treating tough algae,” by Terry Arko in the March 2017 edition of The IPPSAN, a publication of the Independent Pool & Spa Service Association, Inc. Please contact Pinnacle USA Service Department for any assistance.